Frankly speaking, there’s a new dog in play at Cheney Stadium ! 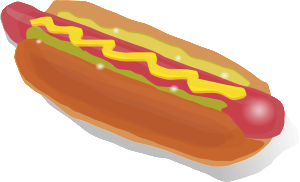 Peanut butter on a hot dog? . . . Batter up! 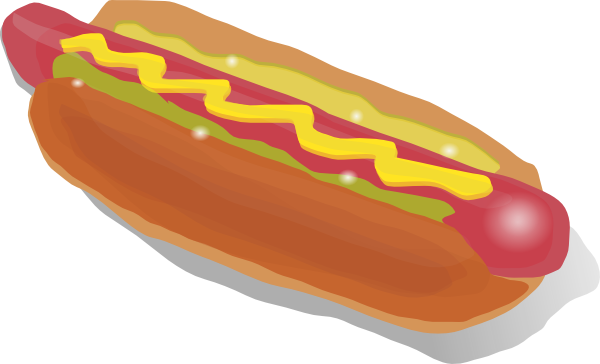 Look for a new and local purveyor of franks, brats and other sausages at Cheney Stadium this year. The Tacoma Rainiers announced Monday that The Red Hot has been crowned the newest addition to the club’s 2015 food and beverage lineup. The Tacoma-based sausage-sandwich enterprise will make its stadium debut when the Rainiers open their home season at 7 p.m. on Friday, April 17, according to a release. The new culinary kiosk will reside along the home plate side of Cheney’s main concourse area and will be open during each of the team’s 72 scheduled home games, as well as at select concerts, festivals and other specialty events. “Once we sat down, tasted hot dogs, and met Chris and Stu, this decision became a no-brainer,” said Rainiers President Aaron Artman. Offerings on the Red Hot ballpark menu will differ slightly from the items available at the Sixth Avenue location. So if you’re of such a mind, how about a hot dog topped with peanut butter, bacon, and Cracker Jack? Another dog is capped with cream cheese, grilled onions, tomatoes and celery salt. These will be served along with a selection of other sausages, in addition to both vegetarian and vegan options. As the official specialty hot dog provider of Cheney Stadium, The Red Hot will also take over as culinary caretaker of the Rainiers most coveted concession item, “The Best Hot Dog in Baseball.” The classic version of the quarter-pounder comes with grilled onions, sweet relish and beer mustard, and can now be upgraded to include cream cheese, bacon, sauerkraut and dill. Massive plans for Hailsham sports park UK ! ‘Severe deficiency’ in amount of sporting opportunitiesThe dream of a new multi-purpose sports park to meet the needs of Hailsham’s increasing population moved closer to reality this week. Hailsham Town Council on Wednesday agreed to give its full support to the local Sports Alliance’s major project, aimed at securing land and funding. Representatives from Hailsham and District Sports Alliance attended the council’s meeting to highlight the existing provision of sports facilities in the town and to request the council’s formal backing on a project to improve access to sport, develop partnership working, actively promote sport in the community and secure a suitable piece of land dedicated to sport for Hailsham. The Alliance’s Chairman, Steve Wennington, outlined the current problem with the lack of indoor and outdoor sports facilities, how local organisations can work together to secure the land for a new sports park and help make Hailsham a destination town – not a sports commuter town. Mr Wennington said, “Hailsham used to be a leader in providing sporting facilities and back in the 1870s we had more sports area (by population) than is currently the recommended minimum. He said the goal was the creation of a multi-purpose sports park to include a floodlit artificial turf pitch as a priority as well as ancillary provision such as changing rooms, showers, toilets and function space. Hailsham is the largest town in the Wealden District, yet has some of the least adequate sports field facilities for its size in the country. An analysis conducted this year by a sports consultant concluded that the deficit is already 15 acres of facilities, and by the time the current agreed housing development in Hailsham is complete, that will rise to 26 acres. It was discussed by councillors and Sports Alliance representatives that preference is to have a site for the new facility in or within very close proximity to Hailsham, so it is seen as a town/community asset. However, this will require agreement with local farmers/landowners and a negotiation with developers for suitable funding and a meeting with Hailsham and District Sports Alliance has been scheduled for later this year. Town Clerk John Harrison said, “Proof that additional sports facilities are needed for future generations in Hailsham to thrive has already been provided and the next step is to form a workable plan to deliver a sustainable solution, and the determination of the community is essential to see the project through. Feds promote artificial turf as safe despite health concerns ! Lead levels high enough to potentially harm ! Lead levels high enough to potentially harm children have been found in artificial turf used at thousands of schools, playgrounds and day-care centers across the country, yet two federal agencies continue to promote the surfacing as safe, a USA TODAY analysis shows. The growing use of turf fields layered with rubber crumbs has raised health concerns centered mostly on whether players face increased risk of injury, skin infection or cancer. The U.S. has more than 11,000 artificial turf fields, which can cost $1 million to replace. But largely overlooked has been the possible harm to young children from ingesting lead in turf materials, and the federal government’s role in encouraging their use despite doing admittedly limited research on their health safety. Lead is a well-known children’s hazard that over time can cause lost intelligence, developmental delays, and damage to organs and the nervous system. The Consumer Product Safety Commission, charged with protecting children from lead in consumer products, has promoted turf-and-rubber fields for nearly seven years with a website headline declaring them “OK to install, OK to play on.” A news release says, “Young children are not at risk from exposure to lead in these fields,” even though the commission found potentially hazardous lead levels in some turf fibers and did not test any rubber crumbs, which are made from recycled tires that contain roughly 30 hazardous substances including lead. The Environmental Protection Agency has promoted the use of rubber crumbs in athletic fields and on playground surfaces since 1995 to help create markets for recycled car and truck tires.But the EPA didn’t investigate the potential toxicity until 2008 and now says in a statement that “more testing needs to be done” to determine the materials’ safety. “We’re using your children as part of the poison squad,” said Bruce Lanphear, a leading researcher on lead poisoning at Simon Fraser University in Canada, who suggests a moratorium on installing artificial-turf fields until their safety is proved. Forty-five of 50 New Jersey schools and towns contacted in 2009 by epidemiologist Stuart Shalat would not let him test their turf-and-rubber fields, Shalat’s report states. The health threat is substantial enough that the federal Centers for Disease Control and Prevention lists artificial turf as one of seven sources of children’s lead exposure along with well-known items such as paint, water and toys. The CDC in 2008 said communities should test recreational areas with turf fibers made from nylon, and they should bar children younger than 6 from the areas if the lead level exceeded the federal limit for lead in soil in children’s play areas. But some communities have refused to test their fields, fearing that a high lead level would generate lawsuits or force them to replace and remove a field, which costs about $1 million, according to a 2011 New Jersey state report. “If you’re exposing children to some potentially harmful compounds, whether it’s organic compounds or metals, you’d think you’d want to know so you can take some action instead of putting your hands over your eyes and saying, ‘I don’t see a problem,’ ” Shalat said. Industry groups have touted the federal endorsements, which have helped vastly expand the nation’s use of artificial turf. It now blankets more than 11,000 fields, from NFL stadiums to elementary-school plots, and millions more square feet at resorts, office parks and playgrounds, according to the Synthetic Turf Council. “There is tremendous growth in all sectors of the industry,” the council says, calling turf a durable, year-round playing surface that needs no watering, pesticides or fertilizers. The council says turf materials are safe for people of all ages who may absorb particulates through ingestion, inhalation or skin contact. Government and academic studies “all have concluded” that a turf-and-rubber field “does not pose a human health risk to people of all ages,” the council says in a PowerPoint presentation. But the council mischaracterizes some studies and ignores scientists’ warnings about children possibly ingesting lead in turf fibers and rubber crumbs. Only a few studies have investigated the possible harm to young children from ingesting turf fibers or rubber crumbs, which can be as small as a pencil tip or as large as a wood chip. The studies analyzed a small number of turf materials. A widely cited study by California officials in 2007 did not consider health effects of children ingesting rubber crumbs or turf fibers. The study analyzed three playground surfaces made of crumbs fused into a solid rubberized surface and found negligible risk from children ingesting rubber dust that might get on their hands or from swallowing a rubber chunk once in their lifetimes. “Research consistently supports the safety of recycled crumb rubber,” said Mark Oldfield, a spokesman for the California Department of Resources Recycling and Recovery. Nonetheless, the department is planning a new study on health effects of artificial turf and crumb rubber that will look at children ingesting crumb material chronically. 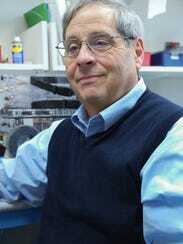 Connecticut state toxicologist Gary Ginsberg says turf materials would not be a “major source of lead” for young children given the limited amount of time they spend on a field or playground. At least 10 studies since 2007 — including those by the safety commission and the EPA — have found potentially harmful lead levels in turf fibers and in rubber crumbs, USA TODAY found. Researchers flagged fibers and crumbs that exceeded the federal hazard level of 400 parts per million (ppm) of lead in soil where children play. The limit aims to protect children if they ingest lead-contaminated soil — either by swallowing soil directly or by putting dirty hands and toys in their mouths. “Every turf field has to be analyzed in detail to be sure it doesn’t have a problem,” said Paul Lioy, a professor of environmental and occupational medicine at the Robert Wood Johnson Medical School in New Jersey. California has set a much lower standard for lead in soil: 80 ppm. When the Los Angeles school district in 2008 tested turf-and-rubber play areas in its preschool facilities, it used 60 ppm as a safety level. After two play areas recorded lead readings in the low 60s, the district removed the turf-and-rubber surfaces from all 54 preschools and replaced them with solid rubber or asphalt at a total cost of several hundred thousand dollars. Artificial turf at a Nevada day care had 8,800 ppm of lead — 22 times the federal soil hazard level, according to a 2010 study led by a scientist at the federal Agency for Toxic Substances and Disease Registry. In 2008, New Jersey health officials found lead levels eight to 10 times the federal level in both school athletic fields and in turf marketed for residential use. 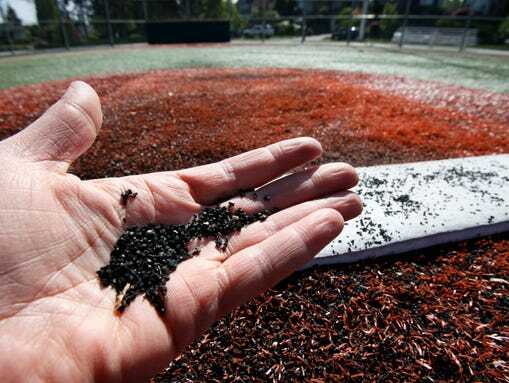 Turf-and-rubber fields typically contain about 200,000 pounds of rubber crumbs, made from thousands of former car and truck tires that may have varying levels of hazardous substances. A single field can have “substantial variability” in its materials and in the “concentrations of contaminants,” the EPA wrote in a 2009 study, listing 32 potential contaminants including arsenic, benzene, mercury and toluene. The presence of lead in turf or rubber crumb does not automatically endanger children. Health damage depends on how much lead children absorb into their bloodstream after ingestion. And absorption depends on whether the lead is tightly bound to the turf or crumb — or easily extracted during digestion. The EPA’s 2009 study said that more than 90% of the lead in rubber crumbs tested was “tightly bound” to the rubber and “unavailable for absorption.” The results “do not point to a concern” about artificial turf-and-rubber crumb harming human health, the agency said. “When people ingest this (crumb rubber), the gastrointestinal tract, the bile fluids, will get the lead out. That means it will be getting into the body, not just passing through,” said the study’s chief author, Jim Zhang, a Duke University environmental health professor. Scientists and health officials havewarned also about older turf fibers. Many contain a lead-based pigment that adds vibrancy and colorfastness, and which could release lead particles as fibers get worn, cracked and abraded. “Fibers deteriorate after five or six years. You’re going to get leaching,” Lioy said. In California, after health advocates measured high lead levels in artificial turf at schools and public areas in 2008, the state attorney general sued manufacturers, which agreed to stop using lead-based pigments in turf. Manufacturers began using only lead-free pigments by the end of 2009, the turf council says. It is unclear how many recreational areas have older fibers with lead-based pigment. Turf companies and consultants say a turf field lasts 10 to 15 years. In 2009, before turf manufacturers phased out lead, the U.S. had approximately 4,500 turf fields. Federal regulators began focusing on possible health damage from turf-and-rubber fields in 2008, at least a decade after their installation began. The EPA had been promoting the use of rubber crumbs for various applications since the early 1990s as a way to recycle millions of discarded automobile tires. The agency didn’t consider toxicity until parents began calling its Denver office concerned about children coming home from sports practice covered in rubber crumbs, said Suzanne Wuerthele, a retired EPA toxicologist in Denver who raised concerns within the agency in 2007. In 2013, following a complaint by an environmental group, the EPA qualified the news release for its 2009 study with a note stating, “This news release is outdated.” Yet the note directs readers to a Web page that contains the same study. The commission tested 26 turf fibers from four manufacturers and has neither conducted nor cited research on rubber crumbs. Evansville Names New Sports Park ! EVANSVILLE, Ind. – With the new Evansville Sports Complex as a backdrop, Mayor Lloyd Winnecke today joined members of the Convention & Visitors Bureau in announcing Deaconess Sports Park as the name for the facility. The complex is scheduled to open in late May and already has 21 of the 23 available dates booked for 2015. 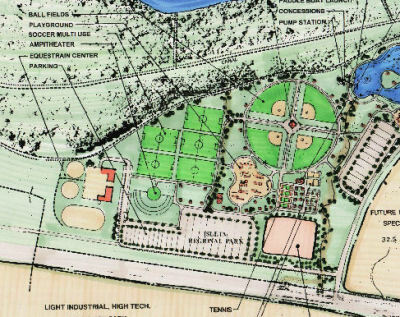 The Complex will provide support to local league and youth softball and baseball programs. Deaconess President and CEO Linda White said sponsoring the naming rights for the sports complex is one way Deaconess is giving back to the community. 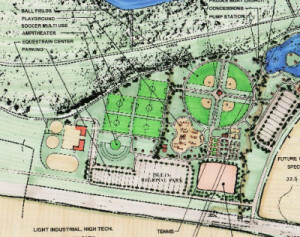 – Deaconess Sports Park is projected to attract 180,000 to 200,000 new visitors annually. – Once fully operational it is projected Deaconess Sports Park will generate $13 million to $16 million annually in direct expenditures into the local economy. – The project represents all BRAND NEW MONEY AND BUSINESS TO EVANSVILLE. Spring Fever and Your Ballfields ! It’s the first week of March and as I write this blog, we have about 5” of snow on the ground and 31” of frost in the ground here at Beacon in Middleton, WI. The calendar has turned the page to March and coaches and players all over are preparing for the upcoming baseball and softball seasons. If you play in the northern or eastern 2/3rds of the US, you are familiar with the brutal February we just battled through. While ballfields in the south are coming to life as the crack of the bat is echowing through their parks, we in the north are suffering through fairly deep snow cover and frost levels and the coaches are getting itchy. Opening up your ballfield for the season in these climates must be done carefully in order to avoid damage to the playing surface ahead of the main season. The tips that follow should help you to get your field underway as quickly as possible with the least amount of damage. If snow is covering your field and the coach demands that they absolutely need to get out there, you can work to remove the snow off the field. It will take equipment, manpower and time to get it done unless of course your field is in the Boston area, then nothing short of a miracle will be needed this year. Use plows on the grass that have either rubber scraper blades or use some type of pipe horizontally across the base of the plow to greatly reduce the potential for turf damag e. If the snow is deep, 3-4 inches or more, be careful trying to push too much off at one time, you could begin to spin your wheels which could severely damage the turf underneath. If or once your ballfield is snow free, wait until the field has lost all frost in the soil profile before attempting any work on the skin portion. If it’s too soft to walk on, you nor anyone else should be on it. The field may look bone dry in the early morning because it is frozen, but as the sun heats the surface the infield skin can become a quagmire as the frost in the ground prevents the free water on the surface from draining through. You’ll know when the frost is out of the ground as the infield skin portion will drain fairly quickly and begin to dry off on the surface and firm up in the strong March sun and wind. If your field is in the northern part of the country where you get a decent depth of frost each year (3″ or more), Mother Nature’s freeze-thaw cycle has naturally aerated your soils and opened up a tremendous amount of pore space in the soil profile. This natural aeration is fantastic for your turfgrass on the field but not for your infield skin surface. That pore space on a skin surface will fill with water on rainy days which will slow the skin from rapidly recovering after a rain event. By rolling the infield skin surface once it has dried enough to get equipment on it, you drastically reduce the pore space in the infield surface which seals the field back up so water will run off the field more efficiently. Fields without snow cover this past winter were at the mercy of the strong winds that come with that season. The strong winds can blow soil, drying agents and topdressing materials into the lips of the infield skin. These lips are natural dams impeding water from moving off your infield skin surface. Be sure to clean or edge out all lips to allow water to freely drain off the surface of the infield skin. Make sure the surface of the skin is smooth and level. Fall is actually the best time to re-level your infield skin so there are no low spots in the skin which will collect water. This exercise best prepares your field(s) for rapid water removal in the spring. If it wasn’t re-graded last fall, go out to the field right after a rain while there are still puddles on the infield skin and, using a rake, carve the outline of each puddle. When dry enough, nail drag the infield avoiding the low spots so you can find them, then use a level board to cut down the high spots and fill the low areas to help the water move off the infield more effectively. Keep some calcined clay drying agents around for those emergencies. But if the puddles are large or deep, then use Beacon Puddle Sponges or a puddle pump to remove excess water leaving just very shallow wet areas where drying agents can then work their magic. Whatever you do, NEVER use brooms to sweep excess water off an infield. You will only worsen the surface grade of the skin by sweeping more soil out thereby creating an even deeper hole for water to stand in. This will also build up the lips even worse creating a bigger dam along the edge. If past winters have taught us anything, it is to always put your ballfields to sleep in the fall ready to play. You’ll find it will make your spring prep much easier and you can get the coaching staff and their team out on the fields much quicker. Spring weather should finally begin to shift northward next week across the eastern 2/3rds of the US. Those of you in the south are probably relieved that you don’t deal with the cold, snow and frost. But as a northerner, I’ll gladly take the snow and the cold in order to catch a little break in the action, than to deal with fire ants, mole crickets, heat and a location where there are events on my field all year long, but then again, that’s just me. Keller, TX seeks vandals who tore up sports park ! KELLER, TX — Police are looking for the vandals who are responsible for a muddy mess. 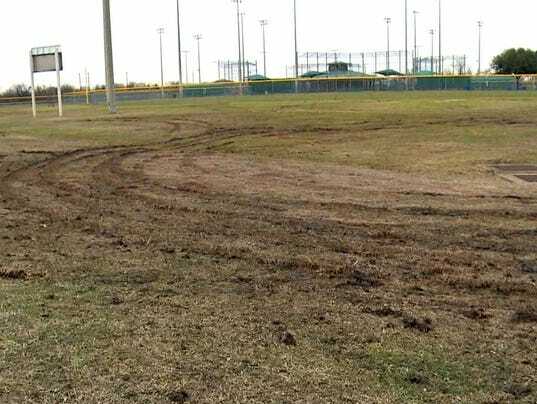 Keller Sports Park is filled with tire tracks, and several fields are ruined because of an off-roading joyride. Investigators believe they captured images of the culprits on camera. Maintenance worker Austin Cole was expecting to see wet and muddy conditions Tuesday during his daily inspection of Keller Sports Park, but he said he didn’t ever expect to see the mess her found. Deep tire marks wrap around the entire park. The muddy tracks are from vandals on an apparent joyride over the weekend. “I work hard — eight hours a day and 40 hours a week — to keep this park in the best condition,” Cole lamented. Keller Parks and Recreation Department maintenance manager Gary Davis said a lot of the damage is on turf all-purpose fields, which makes it an expensive fix. The preparation alone can take more than a week. Right now, they don’t have that kind of time. Opening day for the spring sports season kicks off this weekend. A 24-team tournament is scheduled. “A lot of people are going to be disappointed if we don’t get these fields open,” Davis said. 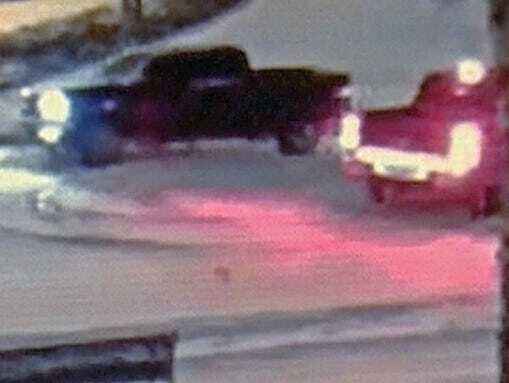 Surveillance video shows two Chevy trucks making donuts near Keller Town Hall over the weekend. Police believe these are the same trucks and drivers involved in the Keller Sports Park vandalism. If you have any information regarding the vandals, you can contact Keller police on their non-emergency line at 817-743-4500. Park staff remains optimistic they’ll be able to start on time this weekend, but they haven’t made the official call just yet. One thing that isn’t working in their favor is the possibility of more winter weather headed our way on Wednesday. New 2015 National Sports Insurance Program ! Hidden Treasure: Sports Park to host city’s annual Easter egg hunt ! The Groundskeeper’s Secret Weapon: Hitting Mats ! USA Softball launches new Amateur Resource Center in partnership with Major League Baseball ! Don’t Forget These Small Business Tax Deductions ! Lightning detectors installed at sports park ! BEACON Athletics Weekly Updates / And Deals ! (Nov.) on Sports governing bodies face issues galore, limited resources ! Cliftonguest on Tiger Stadium to Feature Great New Food Additions !